This starts with a familiar story, booking the whole season, then being told on payday in one town that you have a month off, it would have been too much to ask for them to have told you the truth when you asked two months earlier if that was going to happen. 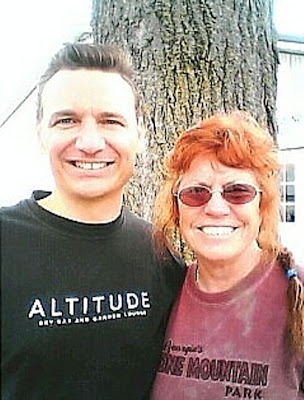 Since Joanne was laying over in Cape Girardo,MO, at Dave Hale's 5-H Ranch and we were fortunate enough to be invited to stay there as well. 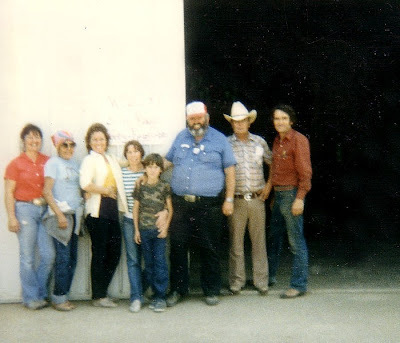 We had never met Dave and had no idea what a treat we were in for, what great hospitality, he immediately made room for our horses in his barn, and welcomed us like family. Of course icing on the cake was a couple other visitors who were there at the time. "THEY CALL ME MR. GIBBS"
Rosa Gibbs, Linda Peeple(?sp), Bobby Gibbs, & Dave Hale. Linda, Rosa, Joanne, Trudy, Steven, Bobby, Dave, & yours truly!!!! Since Dave had to leave for Hawaii with his Petting Zoo before our stay was up, I went to him and asked how much we owed him, his reply, "not one damn cent". And if all that wasn't enough, look who else showed up. 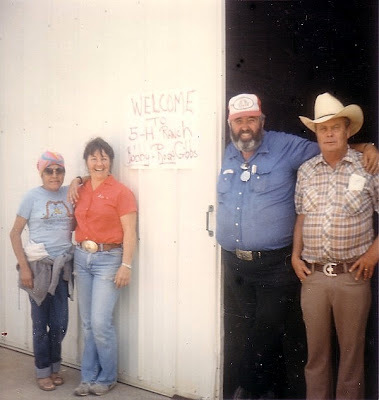 Here's Joanne, Rex, Trudy, & Steven. Rex's young male "Myaka" alias Brat, at the age of 18 months. 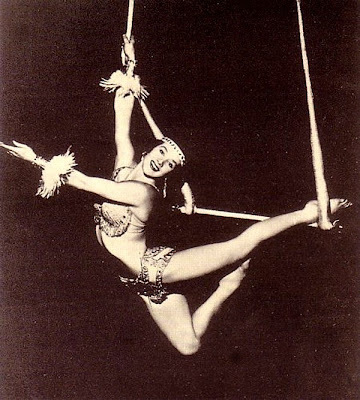 Does anyone recognize this Aerial Duo, of the "50's & '60's? Off subject trivia question,,,,on what radio show did you hear the phrase, "I have a lady in the balcony doctor"? Trudy is wearing her Single Trapeze costume for the production number "Deep Purple"
Trudy is now wearing her Juggling-Globe Act costume,,,,,,,well I changed T shirts! I have to say here, clowning was the hardest thing I ever tried, it was fine in gags, where you have a routine to follow, but when you are on your own it's something else. Bye the way Trudy is carrying 4 1/2 months extra weight, his name is David. Here he is with the boss, on Hoxie Bros. 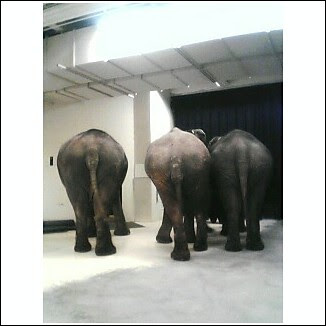 Circus!!!! 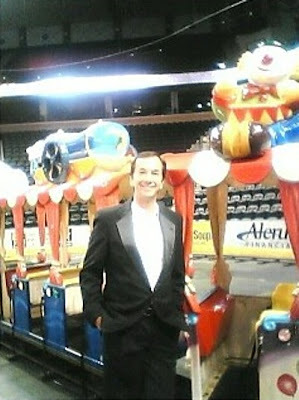 & he still finds time for Juggling & Unicycle too!!!! This is TJ at work. 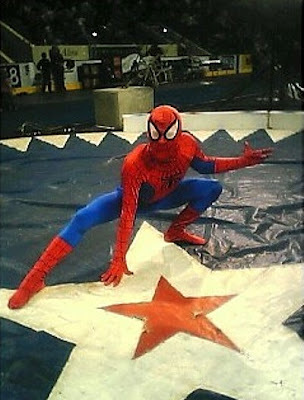 I don't know if Spidey,aka Fletcher Runyon spun any webs to swing on or was just there for pics. Just last Sunday they were in Orlando, nice jump!!!! 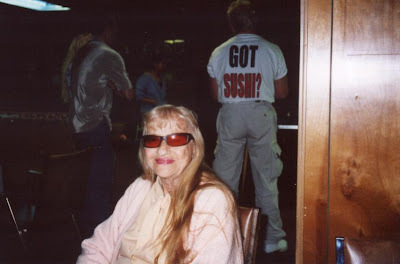 I received news that Showfolks member June DeYoung passed away but have no details. Some of knew her as June Randall, she was Mary Jane Miller's sister. 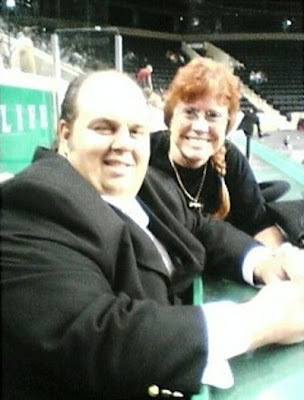 It was reported to me that Rosie had a massive heart attack Thursday night, and passed away Friday evening. I don't have to say how much we will miss her. On Polack Bros. 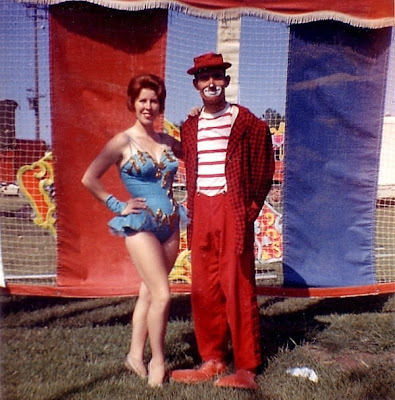 Circus 1960, with Bobby Yerkes' Braytons Teeterboard Act. A surprise visit at the fairgrounds in Fergus Falls MN, where Joanne & PeeWee are laying over with the Cindy Migley Circus. 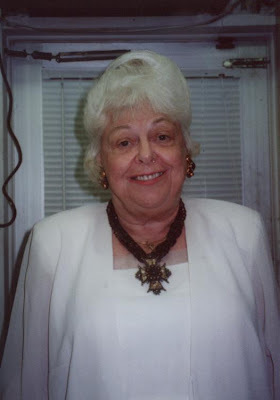 Ottavio is the son of Pietro, & Joyce Bridenbach Canestrelli. Natasha is in search of information on two subjects & thought some of you bloggers might be able to help. The interesting thing about this picture, this guesthouse belonged to Mary Prols(?) 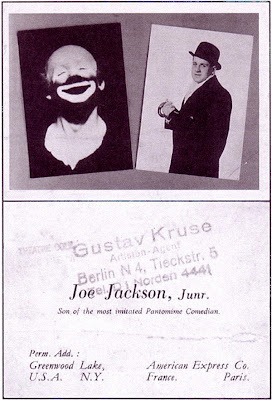 the grandmother of the world famous Tramp Clown, Joe Jackson Jr., he and his father before him were known for their Comedy Break-Away Bicycle Act. 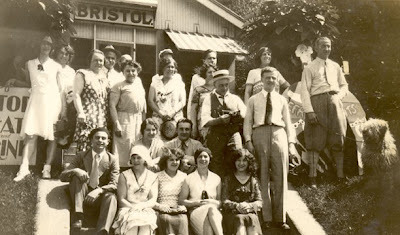 Mother Rialto's was in Greenwood Lake New York, and was where a lot of Euro artists stayed in the thirties and forties. I would like to know more about it and maybe it helps if you could put it on your blog!!!! Note that his Perm. Add. is Greenwood Lake NY. You can watch a two part video of Joe Jackson Jr's act, posted on Pat Cashin's CLOWN ALLEY.NET, Feb. 09/2007. 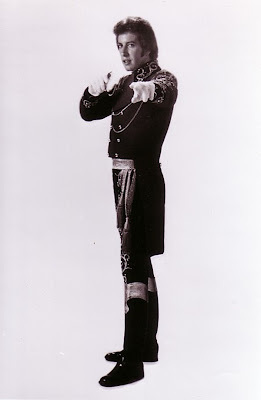 Joe Jackson Sr. (1873 – 1942) was born as Joseph Francis Jiranek in Vienna, Austria. He was Austrian cycling champion, and a member of a world champion bicycle polo team before he became an entertainer. He started with a serious bike riding act, and then developed it into a comedy break. 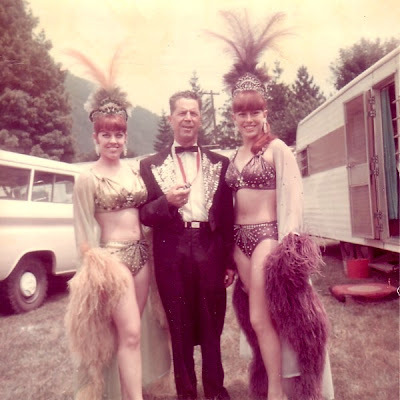 Preferring intimate settings, Jackson worked almost exclusively in Vaudeville and European one-ring circuses. 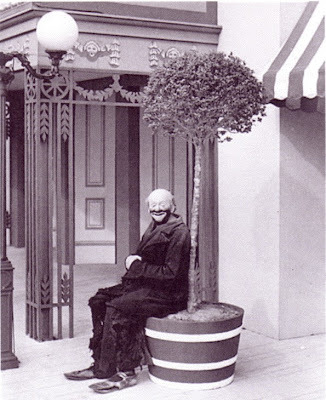 His act took him to England, the European Continent, Russia, Siberia, Turkey, and most of the United States. He encouraged his son to take over the act and it was performed by either father or son for over 100 years. Following a performance at New York's Roxy Theater, he took several curtain calls, and then died in the wings. 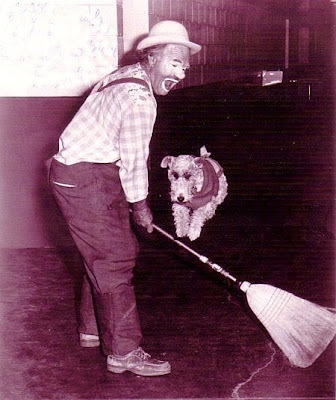 He was inducted into the International Clown Hall of Fame in 1994. Photos & information on Joe Jackson Sr. & Jr. courtesy of Pat Cashin,(CLOWN ALLEY.NET), & his contributor, circusbutterflygirl!!!! I do have another question on the off chance that some one might be able to point me in the right direction. It's a remote chance because no-one in years has been able to give me more info, but you never know... It's a bit from before your time also but the lady might have been performing in the fifties still. equestrian in the late thirties at least and onward ?? for Cole circus as Miss Harietta or Miss Harieta. She married and I never knew her married name. Vandevelde, from Berlin, both of the Van de velde company, Elli was known for a Unus type one finger stand on a bottle. Albert with his wife Kate and Elli with husband Edy (Hartenberger) immigrated to Chicago in the fifties. 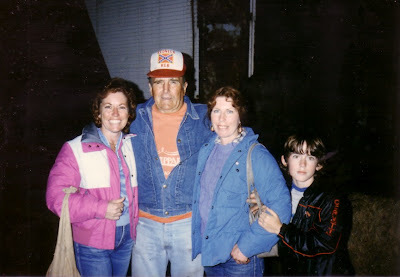 They were friends to the Bradna family also (Ella, Joanne, Joseph, Willy etc). Harieta was already in the US for a long time before that but I know very little of her, and would very much like to know what happened to her. If anyone has a remote inkling who I'm talking about, I'd very much like to hear. Years ago before Interstate Highways, I used to notice little cast iron signs along the roadways and started photographing them with the idea of doing a book about them, and calling it "LITTLE BITs of HISTORY". Well, the idea & the photos got lost somewhere along the way, and the following reminded me of it. 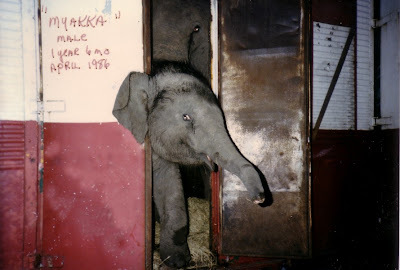 Joanne sent me a tourism flyer with this "little bit" of circus history, many of you may know the story, like me there are probably many of you who do not. The weather was bad on the morning of June 10, 1897; rainy,with thunderstorms approaching. 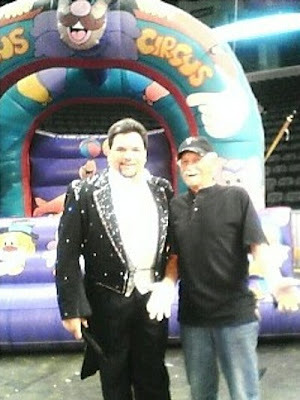 The Ringling Brother's Circus was setting up for a show that evening in Wahpeton. 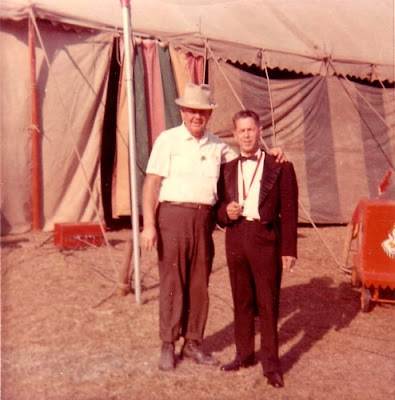 As circus workers raised the tent, a clap of thunder and bolt of lightning pierced the sky, killing two men and injuring others. The two men Charles Smith and Charles Walters, were buried in a pauper's cemetery just south of town. The monument that marks the graves of Smith and Walters is an exact replica of the stricken center pole, right down to rope, pulleys, & chain used to raise the big top. A third man died from his injuries a year later. 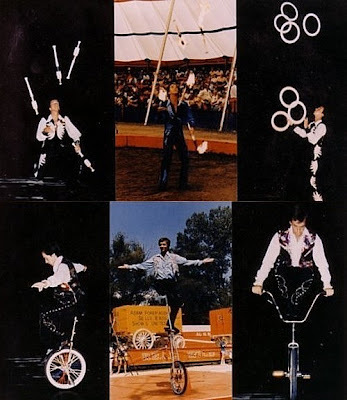 One of my great fascinations in the circus world has always been the old fashioned "High Acts", and even more the monster riggings of "The Great Daredevils" of years gone by. 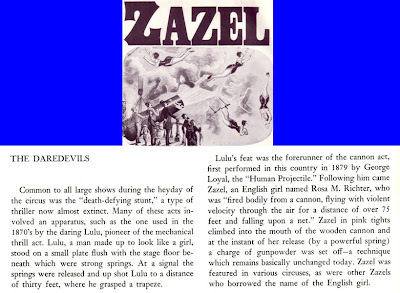 The following pictures & descriptions are from the book, "Pictorial History of the AMERICAN CIRCUS", by John and Alice Durant. 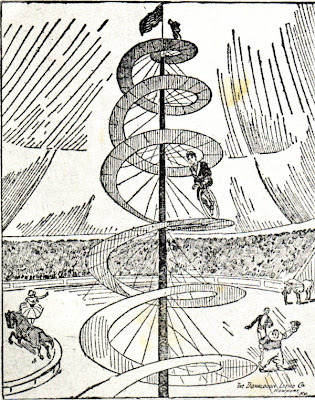 One of the earliest bicycle thrill acts was performed by Leonati, a Frenchman billed on the Forepaugh show in 1883 as the “Spiral Ascensionist”. 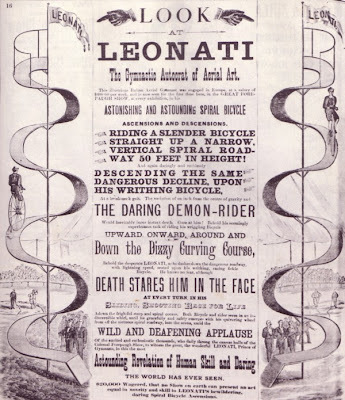 On a high wheeler,(it was before the day of the pneumatic safety bike), Leonati rode to a 50-foot high platform and then descended to the ground. 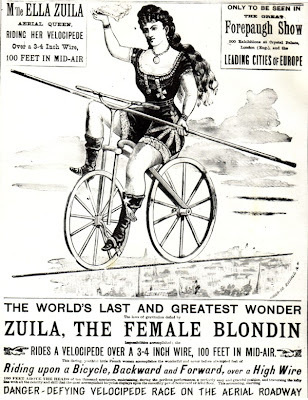 One of the most daring high wire performers was Ella Zuila, shown here riding her wooden bicycle on a 100-foot high wire,(from a Forepaugh courier, 1881). Mlle. 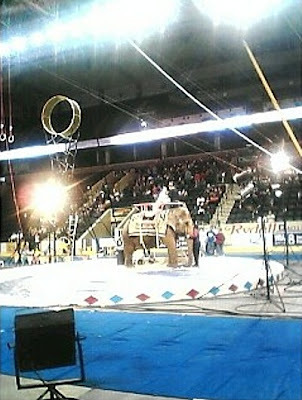 D’Zizi thrilled crowds by leaping her bicycle over six elephants. 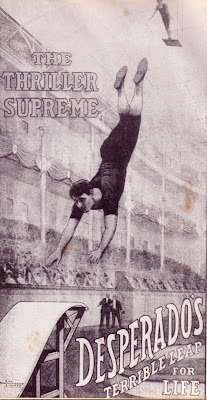 The simplest was the straightaway speed act, as performed by Starr on the Forepaugh-Sells show in 1903. 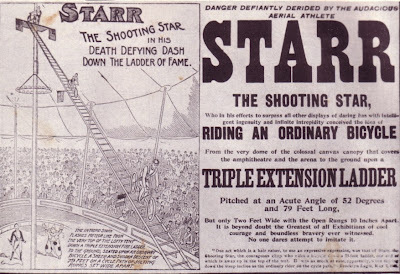 Starr raced down a ladder with enough speed to take him all the way around the hippodrome track. 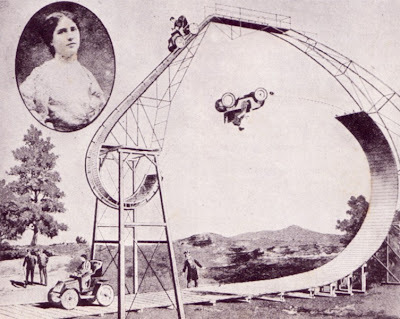 Minting, the ‘Australian Marvel” rode a unicycle on a 20-inch wide track to a height of 60-feet, & then rode back down. 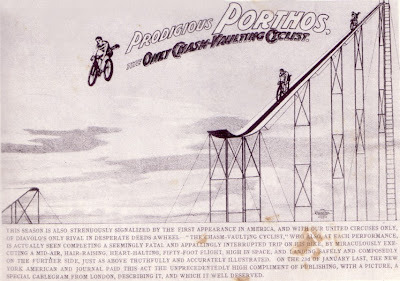 He was by Forepaugh-Sells in 1902 as the “Only Unicycle Ascensionist in the World”. 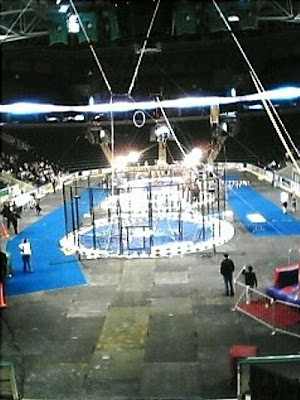 The picture above shows “Prodigious Porthos” in his 50-foot flight,( 5-feet shorter than Mlle. D’Zizi, & without the elephants), from one ramp to another. This was on Forepaugh-Sells in 1904. 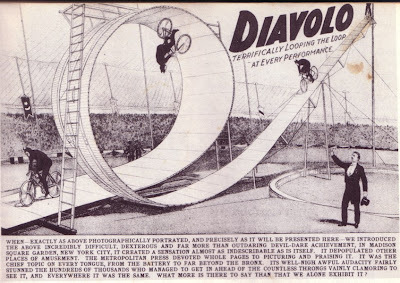 More sensational was the Loop the Loop as performed by Diavlo, also in 1904, he was one of the first to do this dangerous stunt, speeding down a long incline into a 360 degree Loop at great speed. Casualties were high among Loop the Loopers. 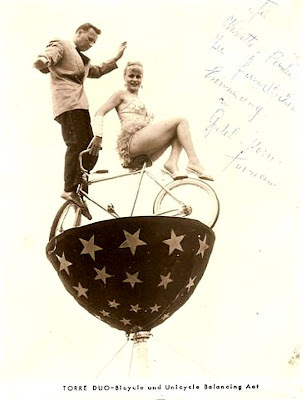 German acrobat Ernest Gadbin performed for Barnum and Bailey just prior to World War I & was perhaps the greatest of all the Daredevils. 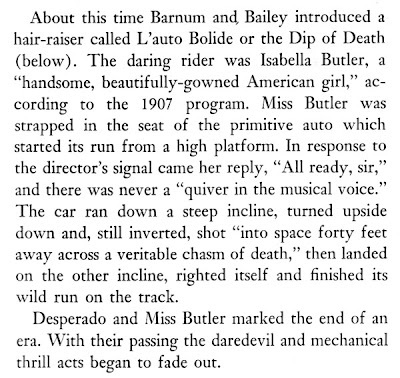 Billed as Desperado, he did a swan dive from an 80 foot high platform landing on his chest at a speed said to be more than 100 feet per second, on a highly polished inclined wooden ramp that was also sprinkled with a thin layer of corn meal. 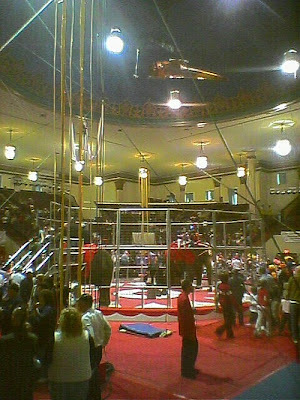 The ramp was turned up at both ends and he would skid down one end, up the other, fly through the air, and land in a net. A personal observation before the description of the final attraction in this series. 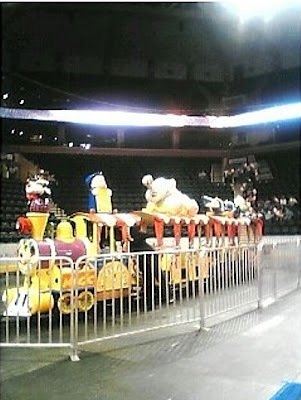 This is without a doubt the most frightening thing I have ever seen. I will leave this description to the author. 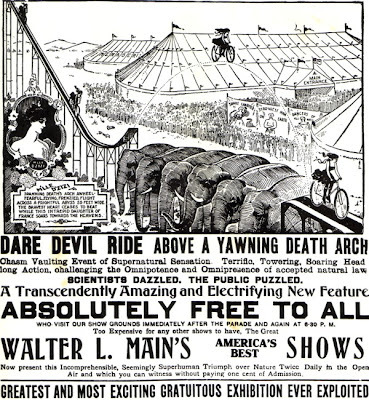 I think I speak for everyone interested in the history of our great world of Circus in thanking John & Alice Durant, for this fabulous chapter from a great book, "The Pictorial History of the American Circus"
Due to the limited floor space the Elephant rides are inside the cat arena. Is that a rocket I see in the air, that type act always looks good in the Jaffa Temple dome. 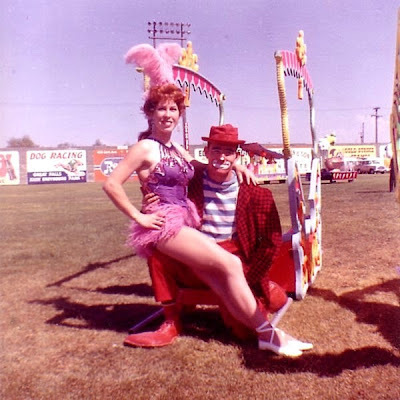 This is Joanne's daughter Kim Sue, handling the Ringmistress duties for the Hanneford Circus in Altoona, PA.
Heidi Herriott was the Hanneford Circus Ringmistress in Sarasota. I just received an email from John Goodall regarding this site. 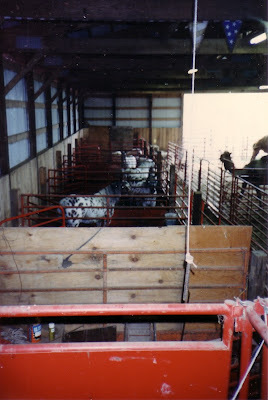 It is definately a "don't miss" for all showmen!!!! Copy this & paste it into your address bar,,,,and make sure your sound is on. MEMORIES FROM THE SCRAPBOOK OF YEARS PAST! "Not now & never again", we're only allowed one of these in a lifetime. 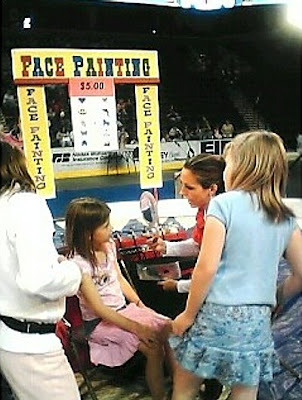 I saw this young lady in Sarasota where she produced the Sahib Shrine Circus, and she looks great. 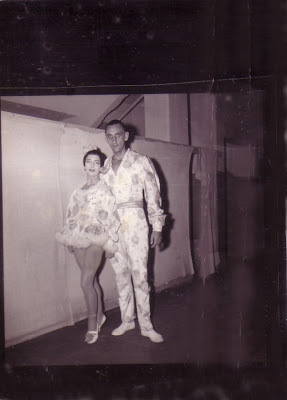 This comes from Ninette Parkers scrapbook, Gretel & Heinz Torreianis. The first time I met them they were doing a High-Wire Act on Polack Eastern in 1955. Here's a guy who personifies a quote by J.C. Penny, "When you fall down,,,,get up"! In my opinion, one of the best modern day Ringmasters. 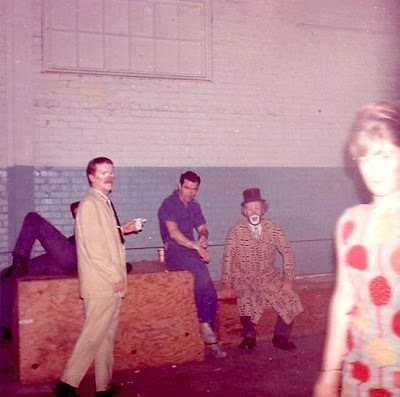 This is back stage at Al Dobritch's ill-fated Batman Circus in Detroit, 1967(?). L to R are Dougie Ashton, Bill Strong, & Merle Cook, all looking at the camera. Incidently the young lady I believe is one of the Stebbing girls. 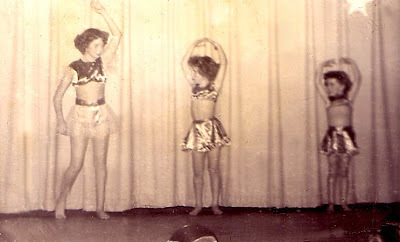 This one might not fool a lot of you, as the title says, this is a grade school dance recital, late 1940's.